Hunter Creek Trail sits along is a beautiful valley corridor that provides access to a variety of great hiking or trail running trails and even an overnight backpacking trip. This gorgeous alpine valley features a babbling tributary, Hunter Creek, which provides a peaceful setting and opportunities for swimming if Fido is along for the trek. The valley is namely a wide-open, treeless meadow book-ended by two parallel ridges riddled with aspen groves. Depends on where you start and where you go. Anywhere from 2 miles to more than 7 miles. Dependent on starting access points. May require ice trekkers in the winter. Hunter Creek Trail is a beautiful valley and corridor which provides access to a variety of great hiking or trail running trails and even provides access to an overnight backpacking trip. This gorgeous alpine valley features a babbling tributary, Hunter Creek, which provides a peaceful setting and opportunities for swimming if Fido is along for the trek. 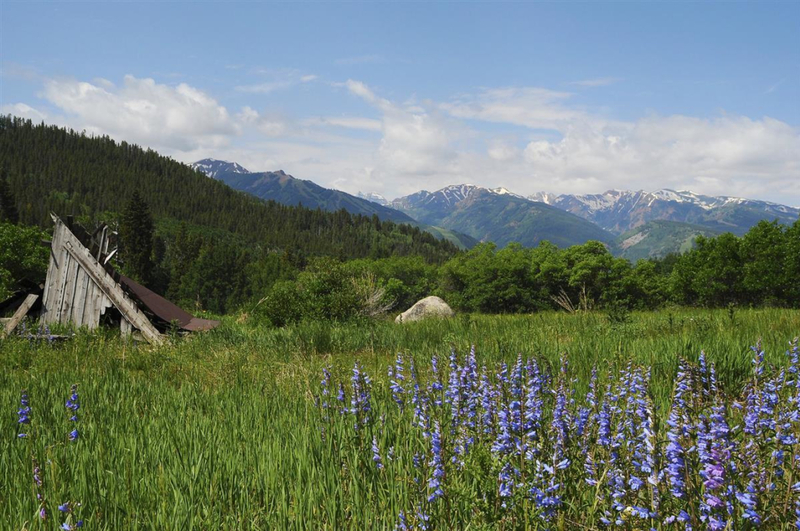 The valley is namely a wide-open, treeless meadow book-ended by two parallel ridges riddled with aspen groves. A hike through this valley in at peak leaf season, late September or early October, is an absolute treat for the eyes. The view looking west towards Aspen is breathtaking, glimpses of Mt. Daly and other iconic peaks are possible, as well as the ski resorts. 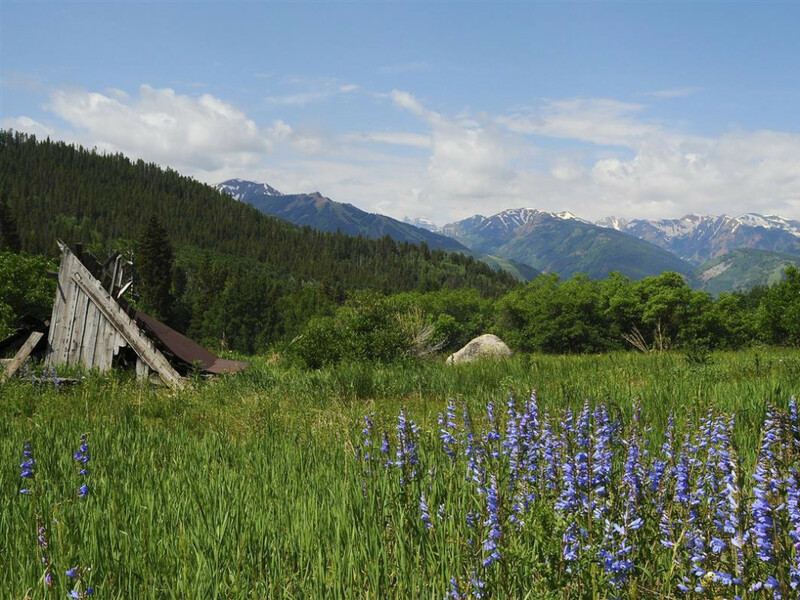 Hunter Creek Valley not only provides incredible views of the surrounding Elk Mountains, but also a glimpse into Aspen’s past. Several historic mining cabins sit along the North Hunter Creek Trail, and one is hidden behind the 10th Mountain Division Bridge. See if you can find it! The adventurous can even go inside these old cabins for a better perspective of how silver-boom miners once lived. Hunter Creek Trail is the main thoroughfare of the Hunter Creek Valley trail system, which is also popular among mountain bikers and horseback riders. There are several options for accessing this gorgeous valley and each option caters to a different level of fitness and experience. The most popular route is from the lower access point is just outside of downtown Aspen, in fact, the Hunter Creek Bus takes passengers right to the trailhead. The first mile from the lower access point winds adjacent to Hunter Creek beneath pine trees. This section of the trail, while shaded, is somewhat aerobic and features about 700 feet in elevation gain. Overnight hikers can access Midway Pass Trail via Hunter Creek Trail as well. Midway Pass Trail is about 8.5 miles from Hunter Creek’s lower access trailhead. Elderly hikers or families with small children will prefer to start the hike from the upper parking lot accessed via Red Mountain Road. Another well-traveled route is from Smuggler Mountain. Hunter Creek Trail starts just left of the large trail sign. It’s also possible to access Hunter Creek Valley from Sunny Side Trail and Midway Trail on Independence Pass. There’s a lot to love about Hunter Creek; it’s accessible for a variety of fitness levels and experiences, as well as simply gorgeous. It’s a popular dog hike, too. Once you’ve reached the US Forest Service sign, which is about two miles from the lower access point, dogs are permitted to be off leash so long as they know sight or sound commands. Like Smuggler Mountain, the views of the Aspen Snowmass ski resorts and surrounding peaks from Hunter Creek Valley provide visitors with a good visual layout of the Aspen area. To access the lower trailhead take the Hunter Creek Bus which stops across from the trailhead parking; or drive north on Mill Street and bear left onto Red Mountain Road. Take the next right onto Lone Pine Road after crossing the bridge. Trailhead parking is on the left. The Pitkin County Public Trail begins just behind the housing development. Signs are posted. To access the upper trailhead drive north on Mill Street, bear left onto Red Mountain Road and follow for 1.1 miles to Hunter Creek Road. Turn Right onto Hunter Creek Road and follow for .3 miles to a blue sign for Hunter Creek parking, just before the stone pillars. Turn left following the signs to the parking lot. Park at the 10th Mt. lot and follow signage to the Hunter Creek trail. Maps of the area can be obtained at the Ute Mountaineer.